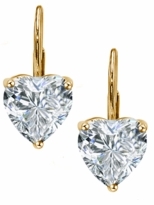 Everyone loves diamond stud earrings. 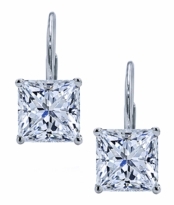 Take the diamond look stud earring to another level with our Cubic Zirconia Leverback Earrings. 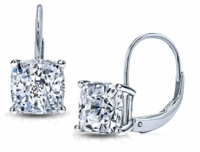 With leverback back earrings, also known as European clip or Euro wire drop earrings, you have the beauty of a diamond look stud earring and a drop earring all in one. 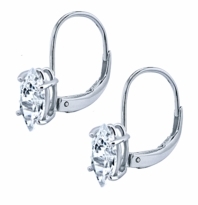 The delicate wire curved post laces through your earlobe and balances slightly below the ear, almost giving it a floating effect. 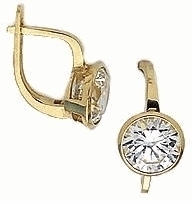 The leverback clip system opens and closes with a built in hinged spring mechanism on the back side of the earring. 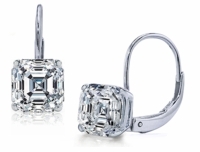 Our Leverback earrings are set with the finest hand cut and hand polished, lab created diamond quality Russian formula cubic zirconia and come in a variety of diamond shapes such as round, princess cut, pear shape, cushion cut, asscher cut, heart shape, oval, triangle, emerald cut as well as many others. 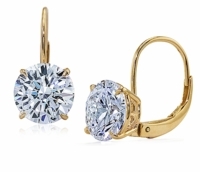 These leverback euro wire earrings are made of solid gold in your choice of 14k yellow gold, 14k white gold as well as 18k gold or platinum.